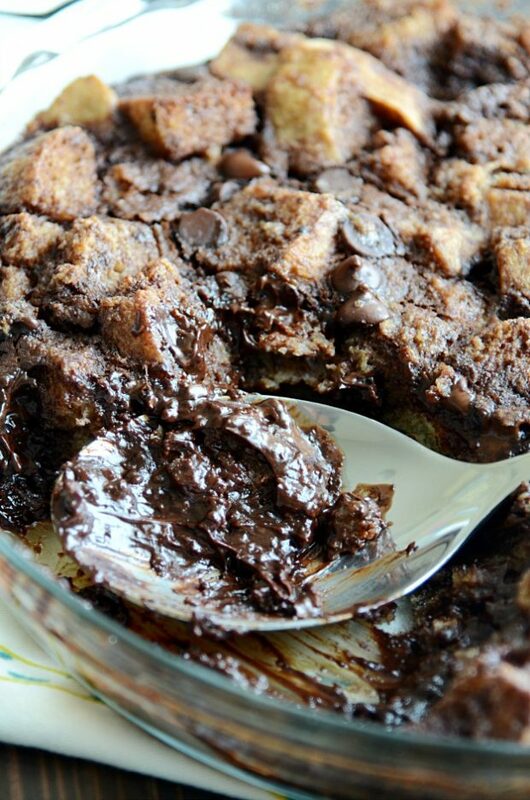 Warm, comforting, stick-to-your-ribs chocolate bread pudding from my family cookbook. 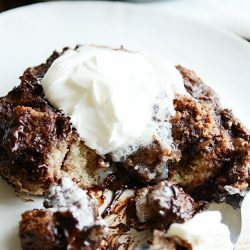 Easy to make, easy to eat! 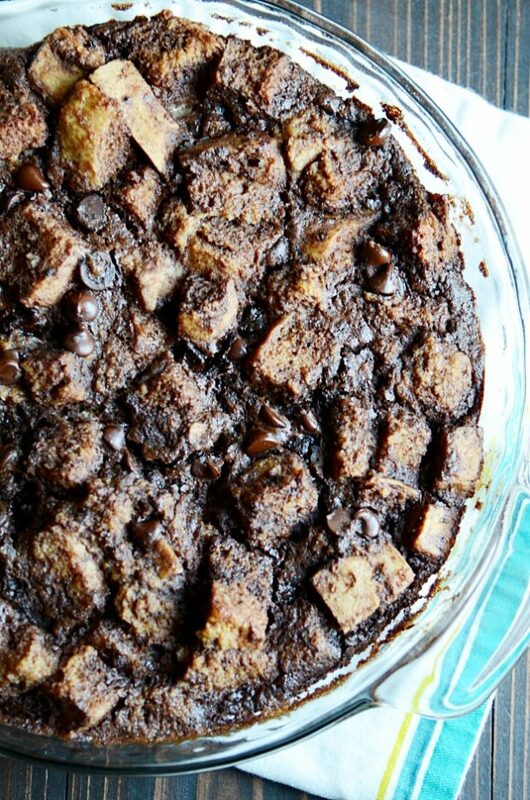 There’s something about bread pudding that I find to be incredibly comforting. Ok. Maybe there’s lots of somethings. I love eating it fresh and warm. It’s thick and hearty and just sticks to your bones, you know? And the smell– oh! the smell! Just imagine chocolate and cinnamon and love wafting through your entire house while it bakes. It’s like grandma wrapping you in a soft, thick blanket. And a hug. And a kiss on the forehead. With whipped cream on top ????. I also love how simple it is to make. 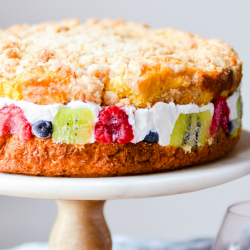 Foods that taste like grandma’s hugs should be simple. Doesn’t that just feel right? ???? Cut up some stale bread. You’ll need 2 1/2 cups. ???? Whisk some stuff together (basically eggs, cocoa, milk, sugar, etc…). ???? Pour the stuff over the bread and stir a little bit. ???? Bake it. Eat it. Feel the hug from grandma. That’s it! See how easy?? 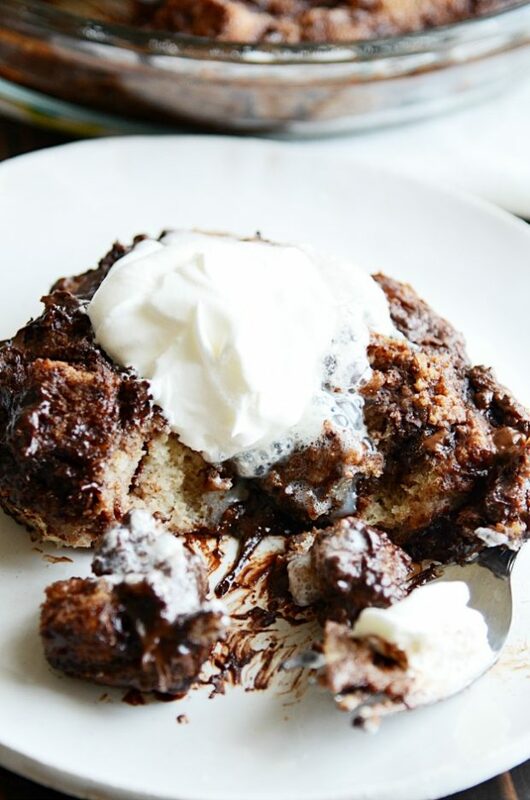 If you can whisk, and you can pour, and you can stick it in the oven… then you are ready to make this love-filled chocolate bread pudding. This recipe comes from my beloved family recipe book, courtesy of my Aunt Ann. Enjoy! Preheat oven to 350ºF. Prepare a round cake pan or deep pie dish by lightly spraying with cooking spray. 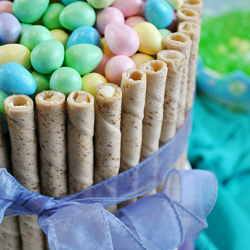 Whisk together the eggs, sugar, and cocoa powder. Add the milk, vanilla, cinnamon, and salt. Mix well. Pour the wet mixture over the stale bread pieces. 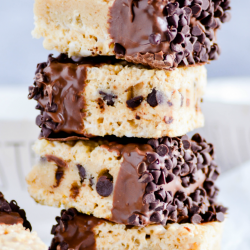 Add the chocolate chips. Gently stir to coat all of the bread in the wet mixture. Transfer to the prepared baking dish. Allow to sit for 15 minutes before baking to allow bread to soak up wet mixture. Bake for 35 minutes. Serve warm or at room temperature with whipped cream.